30.09.2015. Georgian Minister of Agriculture Otar Danelia has noted that September was a successful month for exports of wine. Thus, in the first month of autumn the country exported 3.4 million bottles of wine. Earlier, the National Statistics Service noted that in the period from January to August 2015 exports of Georgian wine fell 46% in comparison with the same period last year. 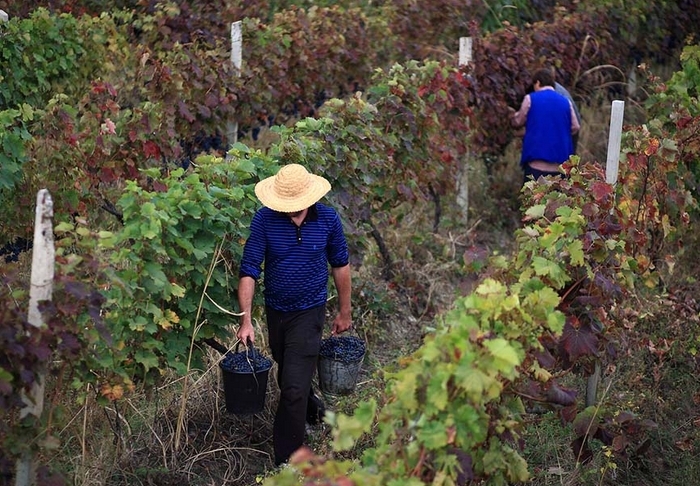 29.09.2015.This year’s harvest in Georgia’s wine-producing Kakheti region has already generated 51,669,513 GEL, and the harvest is not over yet. Today, Georgia’s Agriculture Minister Otar Danelia presented an interim report about the progress of this year’s grape picking and processing activities in Kakheti. He revealed more than 84,000 tonnes of grapes had been processed in Kakheti, with the season still in full swing. Of the different grape varieties in Georgia, the Rkatsiteli variety was the most harvested. 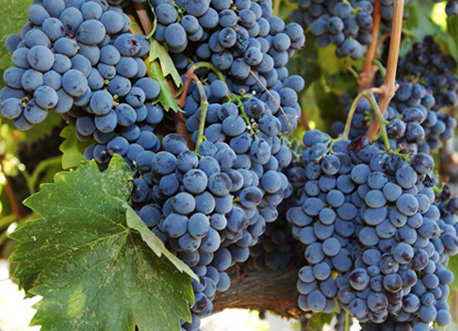 Already this season 39,470 tonnes of Rkatsiteli grapes have been picked, worth about 26 million GEL. The next most popular grape variety to be picked was Saperavi grapes, with 33,592 tonnes picked and worth about 22 million GEL. This was followed by the Kakhuri Mtsvane grape variety, where 2,016 tonnes were picked and worth about 825,181GEL. 28.09.2015. On September 27 Georgian farmers processed approximately 6,981 tonnes of grapes – a 25-year record high, announced Georgia’s National Wine Agency. As of today about 78,000 tonnes of grapes have been processed this season, of which 36,000 are of the Rkatsiteli grape variety, 32,000 tonnes were Saperavi, 1,900 tonnes were Kakhuri Mtsvane and 8,500 tonnes were of other grape varieties. By selling this yield, farmers already earned a share of 48 million GEL, and this year’s harvest is not over yet. In total 67 wine producing companies were involved in grape processing works in Kakheti, including 18 wine enterprises that were hired by the state. 27.09.2015. New York’s most reputable and popular food hub, Chelsea Market, has transformed into Georgian Bazaar this weekend. Chelsea Market, Located in the Manhattan area, hosted a three-day event Discover Georgia, where international visitors could learn more about Georgia, the country by the Black Sea with a diverse landscape, ancient monuments, polyphonic music and the homeland of wine. 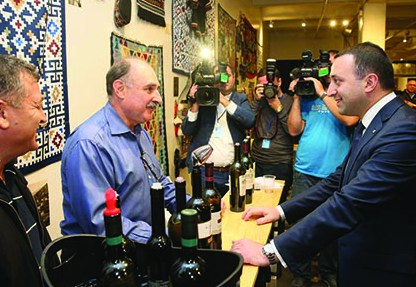 Georgia’s Prime Minister Irakli Garibashvili, who was in New York within the 70th United Nations General Assembly, also visited the area, featuring Georgian arts, crafts, hand-made souvenirs, contemporary artworks, fashion designers’ clothes, traditional textile, music and tourism destinations. The event aimed to promote Georgian goods, increase the country’s export potential and help its small and medium sized enterprises develop. I had learned to clean a qvevri while at Twins Wine Celler in Napareuli in the Kakheti wine region of the country Georgia. The basic process is to pour clean water into the qvevri, and using a brush, scrub the sides. Remove the water and observe the color. Repeat the process until the water is clear once removed. The first time I added water to our qvevri and scrubbed the interior wall of the qvevri, the water was cloudy and opaque. By the fourth bucket of clean water the water had just a touch of cloudiness and was translucent. After the fifth cleaning the water was clear. 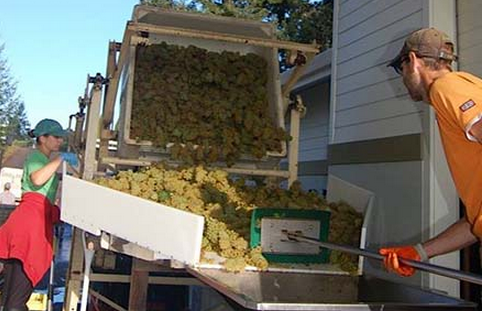 This paralleled the process that was done to the qvevri we made wine in at Twins Wine Cellar. 25.09.2015 (Hvino News). 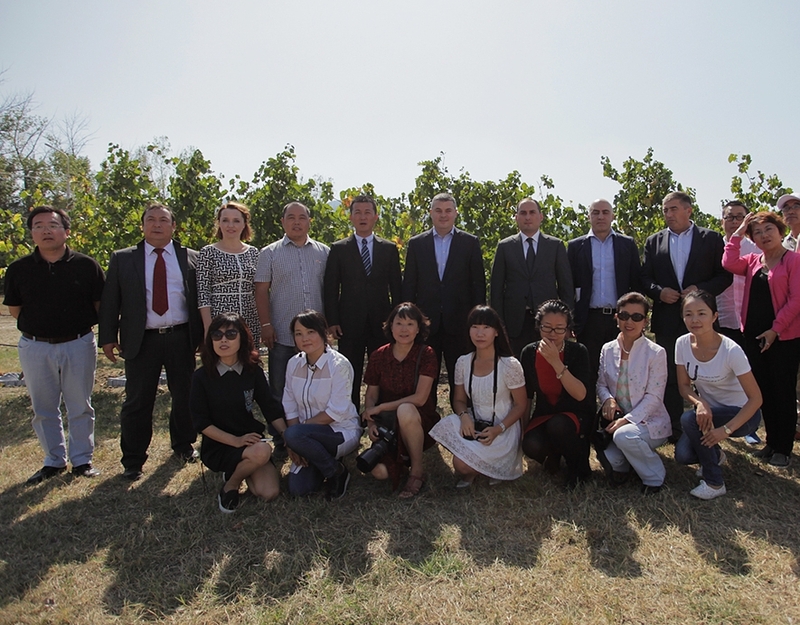 Minister of Economy and Sustainable Development of Georgia Dimitry Kumsishvili together with Minister of Agriculture Otar Danelia hosted the Chinese journalists at the Jighaura Agricultural Research and Development Center. The ministers talked over the trade relations between Georgia and China, introduced the joint projects to be implemented in the future and presented the statistics of the Georgian wine export to the guests. Dimitry Kumsishvili expressed his hopes that Georgia imaged by Chinese journalists shall raise the interest of Chinese people towards our country. “During the recent years trade and economic relations with China are becoming more intensive. China is the third biggest trade partner of Georgia according to the data of the first eight months of 2015. At the same time Georgia is actively supporting the development of tourism potential of the Silk Road. Georgia created internet portal to ease the visa application process to Chinese citizens. 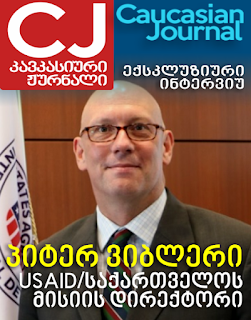 Through this portal Chinese citizens are able to apply to Georgian visa on-line by submitting just passport and application and they will receive electronic visa within the 5 working days,” – Dimitry Kumsishvili stated. 25.09.2015 (Hvino News). Two agricultural cooperatives in Georgia’s Imereti region - Terjola Wine and Winery Sazano are starting wine production with EU financial support. 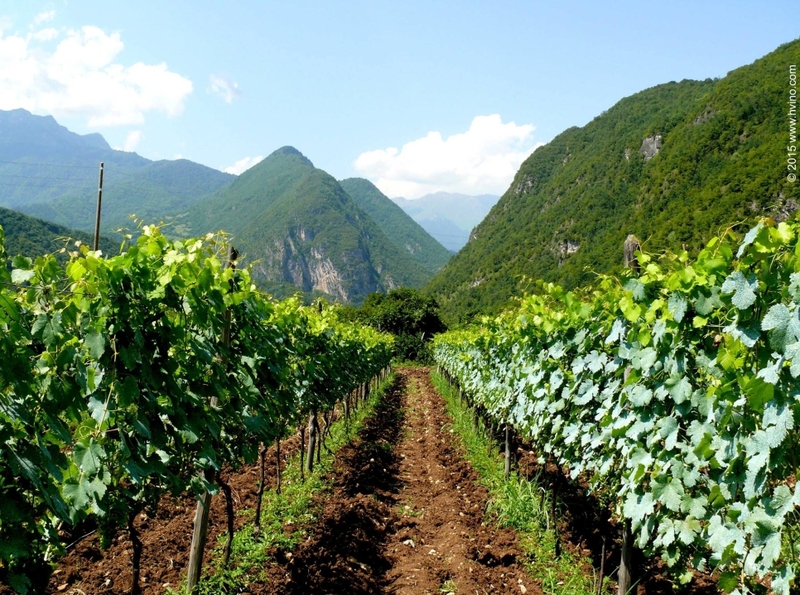 On September 24 the wine production launch ceremony took place in Terjola, Imereti. 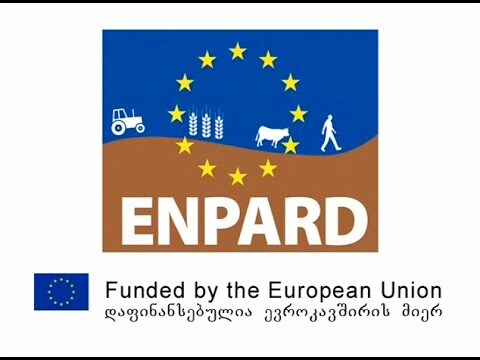 Two cooperatives recently received co-financing and technical support from the EU-funded European Neighbourhood Programme for Agriculture and Rural Development (ENPARD) through its implementing partner People in Need / Czech Republic. The Ambassador of Czech Republic to Georgia, Tomáš Pernicky was present at the ceremony, together with representatives from the local governor’s office. Cooperative Winery Sazano will use the co-financing from the ENPARD programme valued at 76.642 GEL to produce local wines prepared in accordance with EU standards. The total volume of the production for the first year is expected to be 600 litres. Cooperative Terjola Wine received technical equipment for the production, bottling and labelling of high quality wine through ENPARD valued at 74.367 GEL. Terjola Wine will produce three different types of Georgian wines with a total volume of 2,850 litres for the first year with sales expected to reach 72.456 GEL. 22.09.2015. The 2015 grape harvest is in full swing in Georgia’s nine wine-producing villages where a total of 30,477 tonnes of grapes has been picked so far. By selling this yield, farmers generated a collective income of more than 17.45 million GEL, and this year’s harvest is not over yet. Georgia’s National Wine Agency announced most grapes were picked in Gurjaani (about 8,700 tonnes), in Kvareli (about 6,600 tonnes) and in Telavi (about 4,400 tonnes). An additional five tonnes of grapes had been processed in Kvareli, Signagi, Sagarejo, Ambrolauri, Akhmeta, Gurjaani, Dedoplistskaro, Lagodekhi and Telavi – all located in Georgia’s wine region Kakheti. Of the different grape varieties in Georgia, the Saperavi variety was vastly harvested. Already this season 12,877 tonnes of Saperavi grapes were picked, worth about 8.1 million GEL. The next most popular grape variety to be picked was Rkatsiteli grapes where 11,509 tonnes were picked, worth about 7,7 million GEL, followed by Kakhuri Mtsvane grape variety, where 1,261 tonnes were picked, worth about 480,744 GEL. 18.09.2015. The situation in Kakheti, where the most peaceful Georgians, the Kakhetians live, is not stable today. For the first time in post-Soviet history there has been blocking of central highways and clashes of thousands of angry people with police. As a result of the clashes near the regional center of Gurjaani (the grape capital) the police arrested several people. 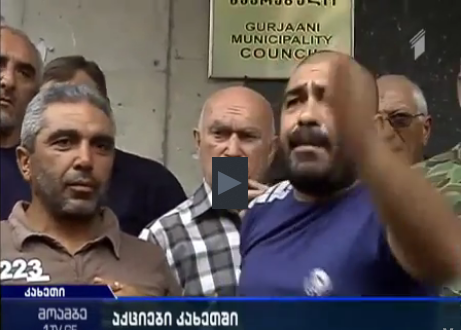 A member of Parliament from the Kakheti region, Giorgi Gviniashvili, was attacked and the protesters presented an ultimatum to the authorities – to solve their problem in the near future, or the protests will be even more violent and radical. There were even calls for "a grape revolution". What do Kakhetian winegrowers want and why are they dissatisfied? 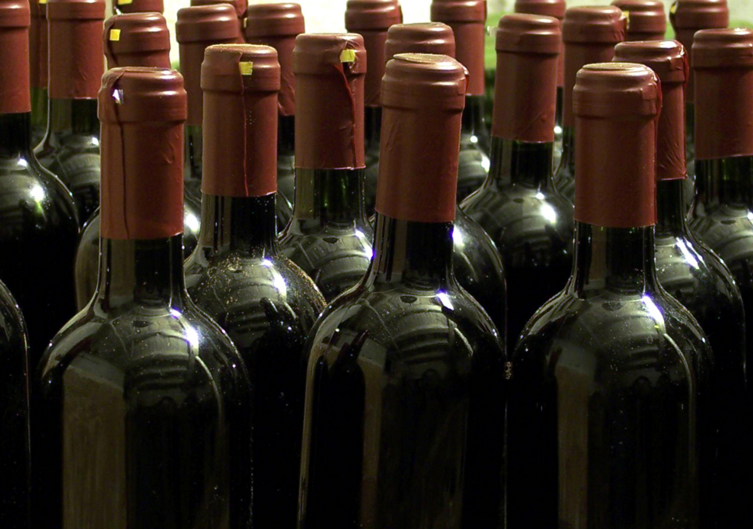 After the opening of the Russian market to Georgian wine in 2013, exports to Russia increased 400%, reaching an unprecedented level since the Soviet era – 4.5 million bottles of vintage wine per month. It's a lot for a small country like Georgia, especially Kakheti, especially after the eight-year embargo on imports of Georgian wines to Russia and grapes, when the peasant farmers were forced to cut down vines out of despair. 17.09.2015. They don’t face quotas and they don’t face tariffs. But for the ancient winemaking countries of Georgia and Moldova, easier access to the European Union, one of the world’s largest wine-markets, is proving a mixed experience. Although wine does not dominate either country’s economy, the beverage is so intertwined with both nations’ identities, that the June-2014 signing of association agreements with the EU led to the expectation that closer economic ties would mean bigger sales for Georgian and Moldovan wines. Russia may be Georgia’s number-one enemy, but it is also, after a seven-year embargo ended in 2013, again Georgian wine’s number-one foreign customer. 16.09.2015. Subsidiary of the VTB Group (Russia) concluded a deal, with the two-factors factoring model, where VTB Bank (Georgia) granted one of the leading Georgian wine manufacturer, Marniskari, a 1,200,000 GEL limit, and the VTB Factoring took upon itself risks of debtors. Factoring is a financial instrument, where the basis for the financing is purchasing of Client’s (Seller’s) accounts receivable by the Factor (the Bank). Factoring service grants the buyer opportunity of deferred payment when purchasing goods or services, and the seller can receive remuneration for supplied goods and delivered services immediately upon their provision. Moreover, factoring is a complex service. Besides financing, it also envisages insuring of non-payment risk, as well as information gathering and analyzing services. 15.09.2015. Farmers continued their protest in the Georgian wine region Kakheti on Monday and clashed with police as they blocked the main highway. 15.09.2015. (Hvino News). 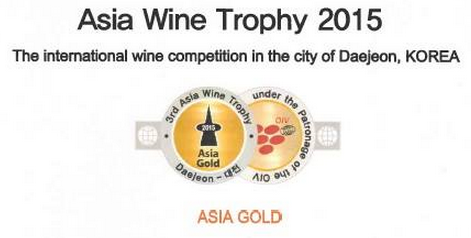 In September Georgian wines have won top awards at Asia Wine Trophy in Daejeon, South Korea. The Asia Wine Trophy 2015, with 3920 registered wines from 29 different countries, is the largest competition in Asia. The 136 international judges have awarded a total of 1173 wines, 21 Grand Gold medals, 720 Gold medals and 432 Silver medals. Saperavi Reserve 2005, Kakhuri Ltd. This wine contest takes place within the scope of the Daejeon International Food and Wine Festival. The tasting is supported by the prestigious Kyung Hee University of Seoul. The Asia Wine Trophy, launched in 2013, became instantly the largest wine competition in Asia. Daejeon International Marketing Enterprise (DIME) and Deutsche Wein-Marketing GmbH collaboratively host and organize the 3rd edition of the event under the patronage of the OIV (Organisation Internationale de la Vigne et du Vin) and the UIOE (Union Internationale des Oenologues). 13.09.2015. (Hvino News). 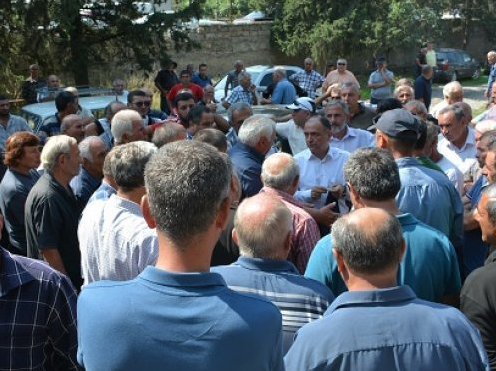 Farmers from Kakheti region, who are protesting over low wholesale grapes price, arrived in Tbilisi and demanded to be allowed to attend the sitting of parliamentary Agrarian Committee. The farmers were admitted to the parliament. The farmers are protesting against Agriculture Minister Otar Danelia’s recent statement, according to which, farmers receive a 100% profit from the current grape price. 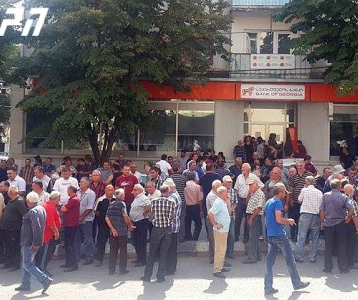 In Kvareli district of eastern Kakheti, farmers have been gathering region since Monday morning to protest over the price of grapes. 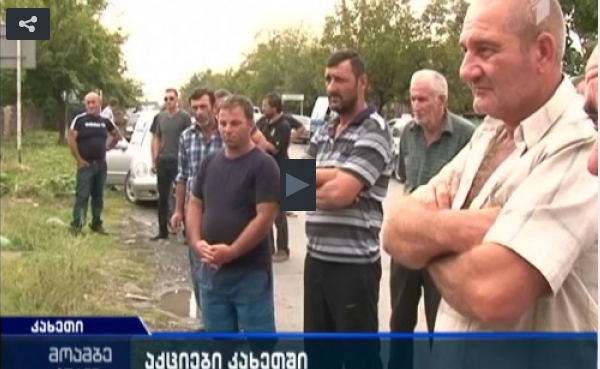 At this moment a hundred farmers are gathered in Telavi-Kvareli highway. They attempted to block the road, but the police did not allow them to do it. Farmers demand increase of price for grapes per kilogram and a meeting with Otar Danelia, Georgian Minister of Agriculture. The farmers allege that white grapes cost 0.6 GEL per kilogram, while the price of redsaperavi is 0.85 GEL. Read more at: Grape growers in Gurjaani protest over low prices. 13.09.2015. 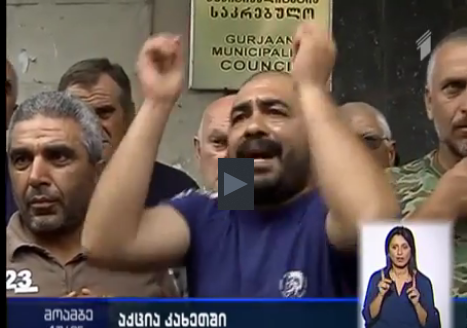 Police and dozens of wine grape growers, protesting lower grape prices, scuffled briefly in Gurjaani, eastern region of Kakheti, after the demonstrators tried to block the main road running through the town on September 11. At least three people were detained by the police. The declining export of the Georgian wine has pushed grape prices down by roughly 40-55% compared to last year, when the average price for a kilo of grapes varied from GEL 1 to GEL 1.9, depending on quality and variety of grapes in Kakheti region, which is home of more than half of Georgia’s vineyards. Grape growers have been protesting for the last couple of days in Gurjaani, demanding from the authorities to increase subsidies and claiming that the existing prices fail to cover their expenses. 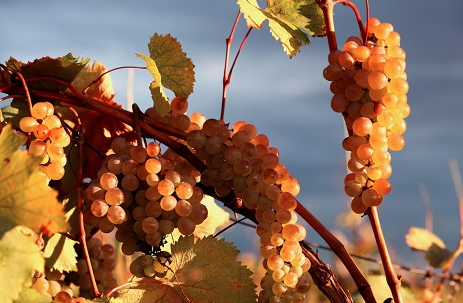 Similar to last year, the government keeps subsidizing grape prices, adding GEL 0.35 per kilo of white grape on top of what the wine maker companies and processing factories will pay; subsidies amount to GEL 0.15 per kilo of red grape in Kakheti. 12.09.2015. Shaloshvili Cellar Ltd, sponsored within the government's concessional loan program, entered the European market. The company received a loan of $ 200 000 within the agro-credit project. According to the company’s director Alexi Shaloshvili, recently their product has been sent to Germany. Two thousand bottles of Georgian wine will be sold in the German market in the near future. He says the company’s product samples were also sent to Switzerland and this country is expected to be added to export markets. As for Russia, despite the big popularity, sales have been suspended due to the current economic events there. It is known that the price of wine produced by the company ranges within 3 – 6 euro. 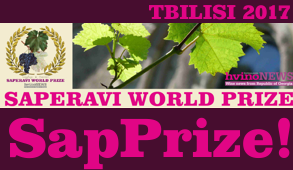 Shaloshvili cellar makes dry wine and Kindzmarauli from Saperavi grapes grown in the company’s vineyard in Kvareli district. The company explains that wine taste is unique because Kindzmarauli is free of impurities, made of the highest quality grapes, is naturally sweet and the fermentation process is stopped by using a refrigerator. 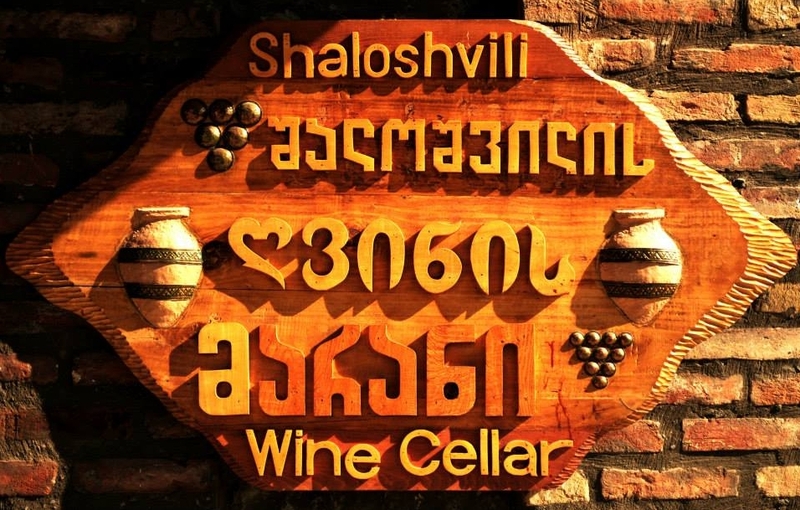 Shaloshvili Cellar was established in 2013. Today the factory is fully equipped with the modern equipment. 11.09.2015 (Hvino News). Georgia will soon begin exporting wine to China’s Dalian Free Trade Zone. Corporation Georgian Wine (CGW) signed a Memorandum of Cooperation with Dalian FTZ on September 10th, according to Prime Minister's Press Office. The volume of Georgian wine to be exported to Dalian was not specified. Prior to the signing ceremony, Georgia’s Prime Minister Irakli Garibashvili met with some of the leaders of Dalian city. 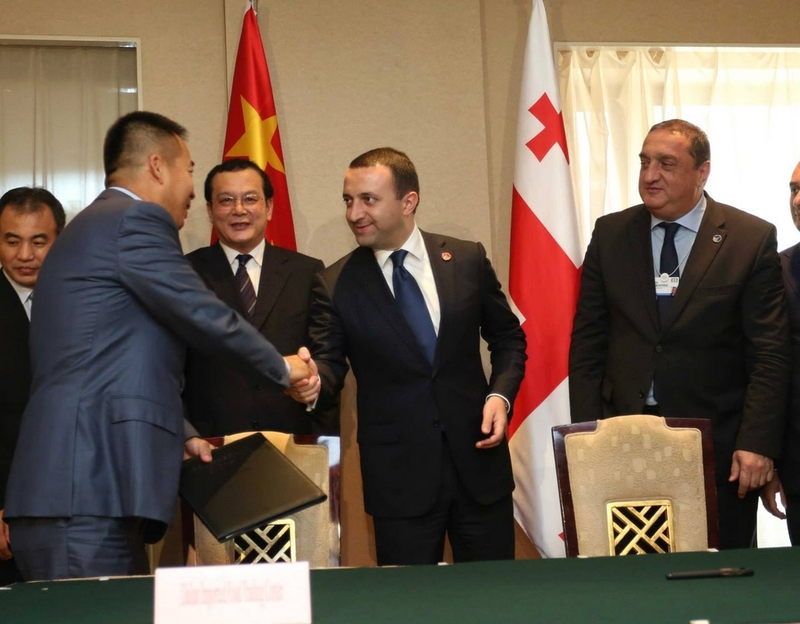 Garibashvili said Georgia already enjoyed positive relations with China but he hoped to forge deeper cooperation in the future, stated the Prime Minister’s press service. These meetings were part of the World Economic Forum, currently being held in Dalian, China, until September 13. 08.09.2015. 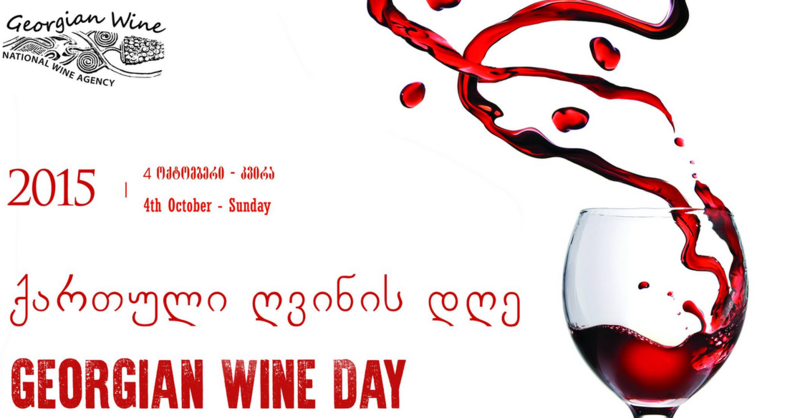 The third International Qvevri Wine Symposium is taking place in Georgia to raise awareness of Georgian wine and the ancient ways it was, and is continuing to be, produced. For three days this week wine industry experts from near and far are in Georgia to learn about unique qvevri wine-making methods. The knowledge is treasured in Georgia and is passed down from generation to generation. Today, 8,000-years-on from when wine was first invented in Georgia, the traditional qvevri method is used. A qvevri is a large clay Amphora-like vessel that’s traditionally buried in the ground up to its neck, in which wine is fermented and stored in regions of Georgia but especially in Kakheti, east Georgia. The first official International Qvevri Wine Symposium was supported by the United States government in 2011. 07.09.2015. The closer harvest time is, the happier I am about that old wise decision to move to Georgia. I have to admit: my love to wine is very difficult to hide, and I am really anticipating this beautiful season, as grapes will be squeezed, put to qvevris (special clay amphorae) and then under the ground, and fresh churchkhela will be sold for hilarious price at every corner. The air will become cooler and clearer, it’s gonna be so pleasant to sit in one of old city wineries with a glass of something straw-coloured, amber or ruby red, something fruity, berry or citrus flavoured… Ah. Even men come and go, and wine always remains (NB: one should be pretty careful and very respectful with both). The idea of this post was born in this thrilling anticipation of rtveli (grape harvest in Georgian). I was about to invite my new flatmates to a winery, was considering which one I should choose… And then decided to inform myself and you, my dear readers, about the huge amount of wines we have here. The best way to learn things is asking questions, so I just headed to my favorite wine shops and bombed the people who work there with those 5 simple questions. 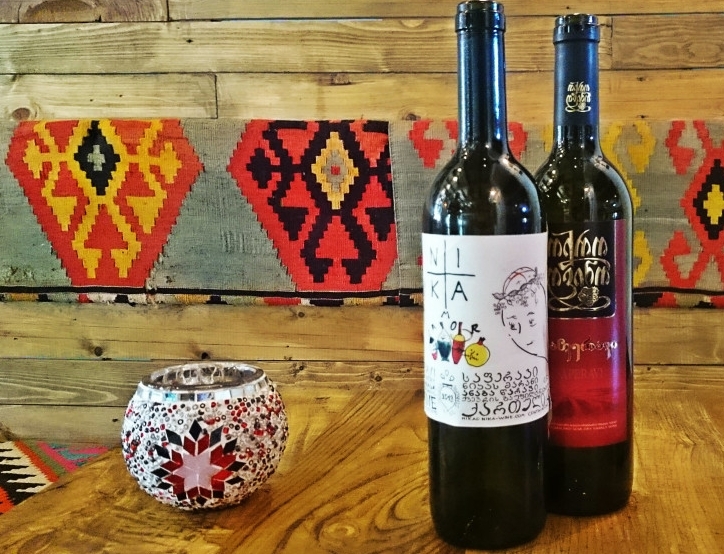 Which one should be the first to try, if you have never ever tasted Georgian wines? 06.09.2015 (Hvino News). 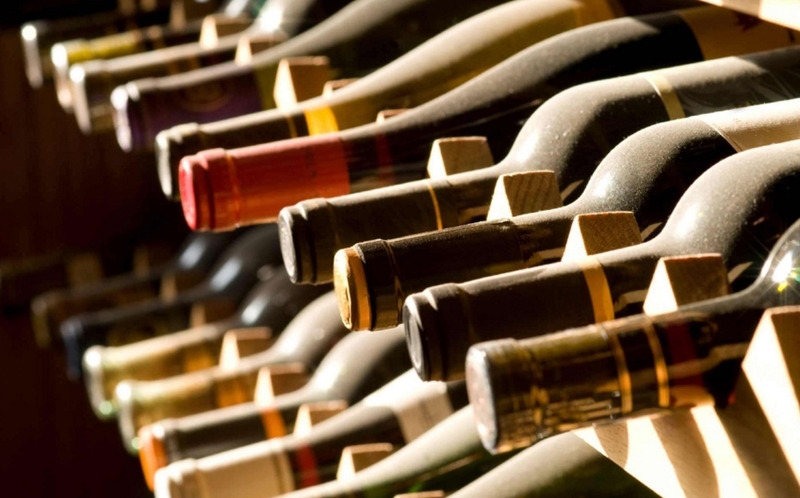 According to National Wine Agency’s data, the increase in export to "strategically important markets" are as follows: China + 23%, Japan +21%, in Latvia + 20%, Estonia +16%, Germany +5%, Canada +159%, USA +61%, Kazakhstan +6%, UK +33%, Hong Kong +230%. Top five importing countries of Georgian wine: Russia - 6 555 183, Kazakhstan - 2 275 722, Ukraine - 1 257 918, Poland - 796 076, China - 759 969 bottles. 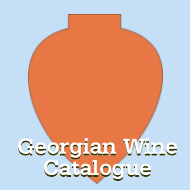 Georgian wine has been exported to 33 countries in total. Most demanded wines are: Kindzmarauli (red semisweet) - 1 960 717, Mukuzani (dry red) - 637 643, Tsinandali (dry white) - 432 128 bottles. "Because of unstable political and economic situation, we have dramatic decrease in 2 of the largest exporting countries - Russia (-63%) and Ukraine (60%), which affects the export statistics of 6 months, which have reduced by 49% compared to the same period of 2014 years statistics", - reads NWA's release. In addition, Georgia exported 152 523 161 bottles (0.5 l) of brandy, 57 402 bottles of chacha (grappa) to 17 countries. Overall income from wine and spirits income exports in the first half of 2015 totals 58.3 million US dollars. 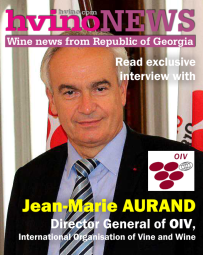 05.09.2015 (Hvino News) For the third time Georgia is hosting the international Qvevri Wine Symposium, which will take place on September 6-8.
the variety of grapes, micro regions, and wines in Georgia. On September 6 the event will be officially opened at the Simon Janashia Museum of Georgia. Opening will be attended by officials from ministries of culture, agriculture, economy. Simon Janashia Museum, formerly known as the State Museum of History of Georgia, is one of the main history museums in Tbilisi, which displays the country’s principal archaeological findings. 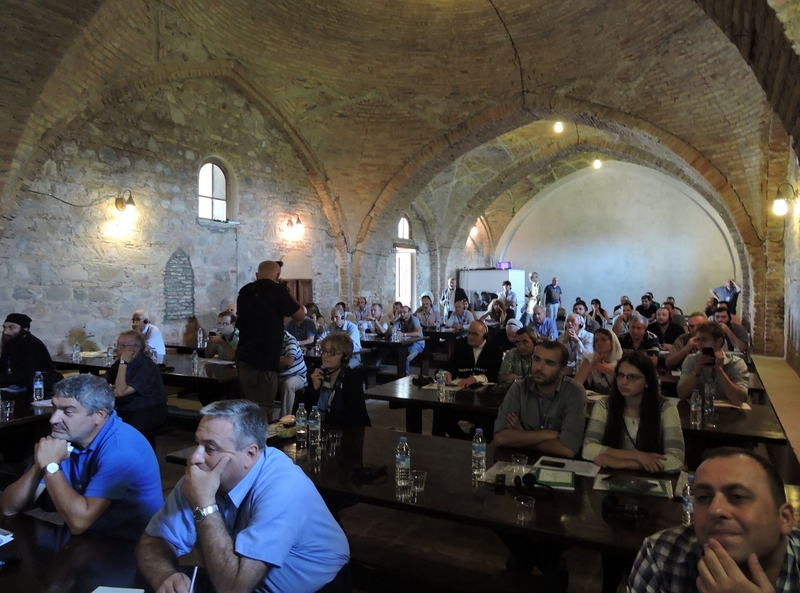 The Qvevri Wine Symposium will continue at the premises of Alaverdi Monastery in Georgia's Kakheti region. Lisa GRANIK, Master of Wine: "Many producers think making good wine is enough; it isn’t"
04.09.2015 (Hvino News). The special guest of Hvino News today is Lisa GRANIK, Master of Wine. Ms. Granik, an internationally acclaimed wine expert, is well-known for her activities aimed at raising awareness about Georgian wines on global scale, and in the USA in particular. She kindly agreed to answer our questions. Hvino News: In the recent months you have visited a number of top-level international wine events – from Boston to Bordeaux, and from Oregon to Tbilisi. You have been educating the visitors from various countries and cultures about the Georgian wine, conducting master classes, tasting events, and seminars. This seems to be a tremendous challenge, given the fact that Georgian wine is still a terra incognita even to wine professionals. For a start, can you remember the most funny, naïve, or just strange question from your audience, which you had to answer during your events? 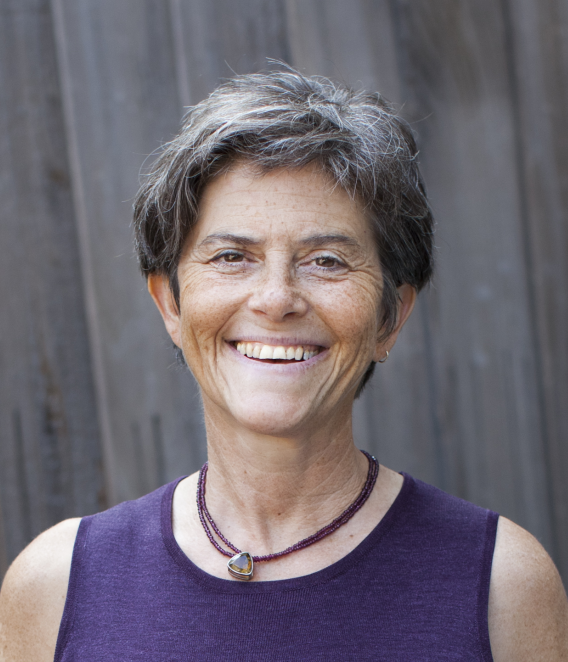 Lisa Granik: Actually, most of the audiences are wine professionals, or quite wine-knowledgeable, and they come with a keen desire to learn more about these wines that have been receiving so much “buzz” and attention lately. The naïvete arises in every seminar, however, as people still think Georgia is a part of Russia, that the Georgian language is a dialect of Russian, and so forth. I need to explain how Georgia and its culture predate Russia, that the Georgian people are a completely different ethnicity, and that only in the past 200 years has Russia been important vis-à-vis Georgia – a blink of an eye for a country that has 8000 years of wine culture! 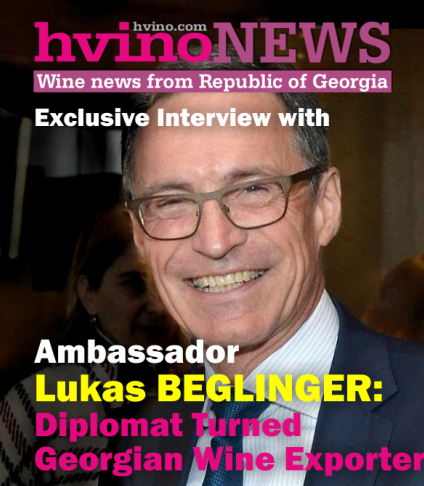 Can the Ambassadors help in Georgia's wine business? 03.09.2015 (Hvino News). 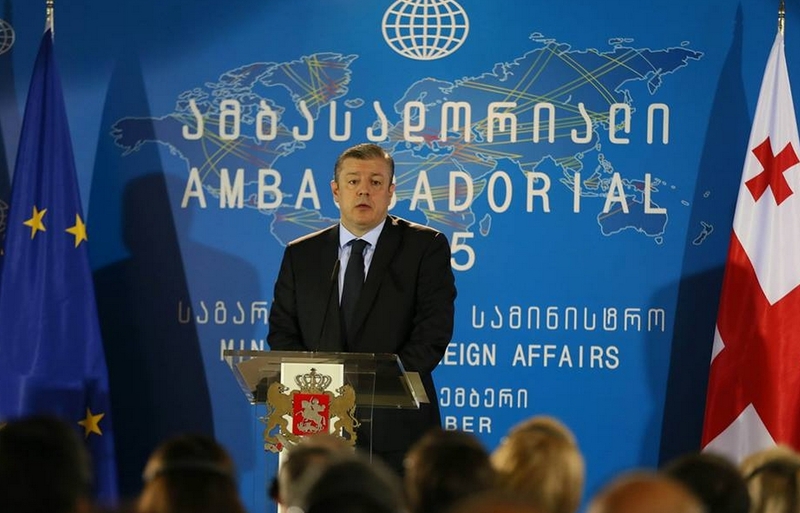 Heads of Georgia’s diplomatic missions abroad gather in Tbilisi this week for the annual Ambassadorial. One of their main concern is to attract foreign investment. New Economy Minister of Georgia asked ambassadors to help in establishing business partnerships. Natali Sabanadze, Georgia's permanent representative to Belgium and Luxemburg underlined that " Georgia should have a representative to the EU who will be fully focused on the economic issues." 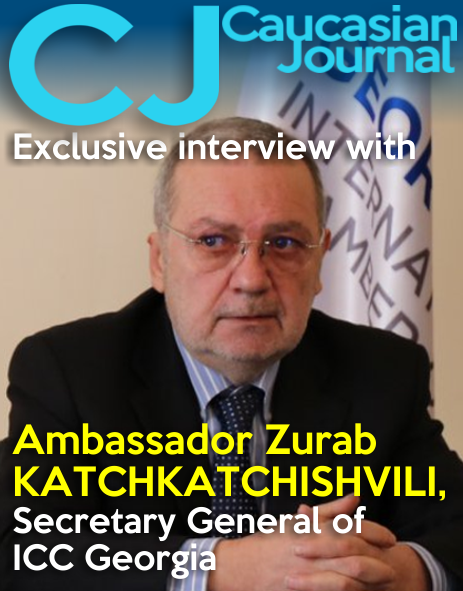 She believes that new foreign minister George Kvirikashvili will devote more attention to economic diplomacy. Some business representatives are skeptical about Georgia’s ambassadors assistance to Georgian businessmen. Director of Schuchmann Wines Georgia Nutsa Abramishvili said that she cannot remember a specific example when the ambassadors helped in searching foreign partners. In comment CBW, Abramishvili says Georgian ambassadors are involved in popularization of Georgian wine abroad, which in this case has no direct effect, but is very important for the economy. However, the wine sector wishes such activities intensified. 02.09.2015 (Hvino News). 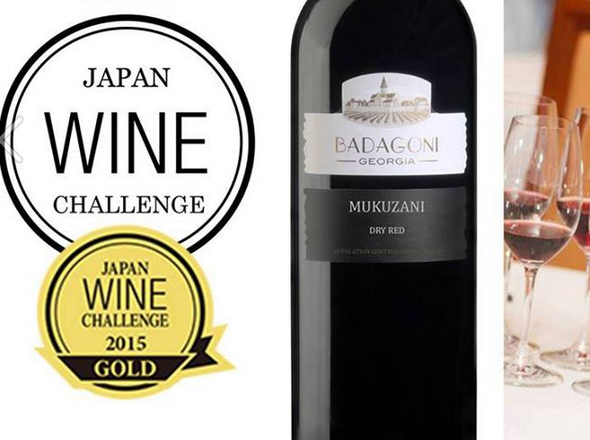 At Japan Wine Challenge 2015 three Georgian wines have won prizes, including the gold. All the winning wines are from one Georgian producer - Badagoni. “Georgian wines have their own stories to tell and it is our greatest ambition to be able to translate them into a language that will be comprehensible to the wine lovers around the world,” said a Badagoni's spokesman. The 18th Japan Wine Challenge 2015 was held in Tokyo from 28th to 30th July 2015. The official awards ceremony will be held on January 29, 2016. A total of almost 1,400 wines from across the world were entered, representing an increase of just under 10% on last year. These were judged by a panel of over 30 top wine professionals from Japan and internationally. These included Lynne Sherriff MW, David Wrigley MW, Anthony Rose, Andrew Caillard MW, Veronique Raisin, Neal Martin, Peter Nixon, as well as their counterparts from Japan.